Vietnam’s representation in the GRA dates to the Ministerial Summit in Rome 2011. Vietnam is involved in the GRA’s Livestock Research Group and Integrated Research Group. 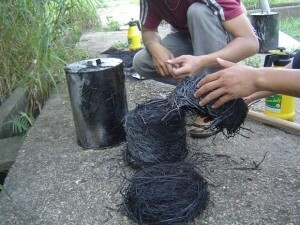 Right: Biochar produced from rice straw is one way to keep carbon sequestration sustainable. Biochar is able to improve soil fertility, enhance crop yield, reduce GHG emissions and increase soil carbon storage (source: author). The Vietnamese Government recognises the importance of mitigating greenhouse gases (GHG) from agriculture. 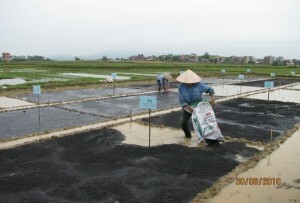 On 16 December 2011, Vietnam’s Ministry of Agriculture and Rural Development (MARD) released decision 3119 (3119 /QD-BNN-KHCN) on “approving programme of Green House Gas (GHG) emissions reduction in the Agriculture and Rural Development sector up to 2020”. By 2020, to reduce by 20% the total GHG emission in agriculture and rural development sector (18.87 million ton CO2e); and simultaneously ensure the growth target of agriculture and rural development and reduce the poverty rate according to sectoral development strategy. 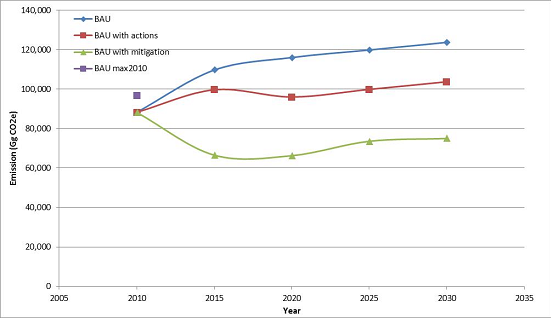 A newly released document of Vietnam INDC introduces 16 mitigation options to plan to 2030 to reduce up to 6.36% % of GHG emissions (without International support) and 39.42% of GHG emissions (with international support).